Russia continues to express its overt rejection of Western ideals, such as the freedom of press, speech and expression. While the civilized world mourned the victims of terrorist attacks in Paris, France, Russian media and politicians chose to blame the victims. They’ve emphasized the need for strict censorship and urged Russia to turn away from the West and to look inward. So far, it’s not a pretty sight. The Russian ministry of culture is proposing a decree that would ban the showing of any film that is perceived as denigrating the country’s national culture, threatening its national unity and undermining the foundations of the constitutional system. This would ban controversial films, such as Oscar-nominated “Leviathan” (the first Russian film to win a Golden Globe since “War and Peace” in 1969) from being shown in its native Russia. The pro-Kremlin political analyst Sergei Markov panned the film as “part of the new cold war the west is fighting against Russia … an anti-Russian film basically made according to a western order, a cinematic anti-Putin manifesto.” It should be noted that “Leviathan” was partially funded by Russia’s Ministry of Culture, which is now condemning the film. Censorship and oppression in Russia continue to extend to every part of the society. Anyone who dares to criticize or question the government’s activities is immediately declared to be a “foreign agent.” For example, Russia’s Justice Ministry has placed the Saint Petersburg branch of the Soldiers’ Mothers rights group on a blacklist of NGO’s acting as “foreign agents,” for seeking public disclosure about the deaths of Russian soldiers covertly sent to fight alongside terrorist elements in Ukraine. Another Russian group, “Committee Against Torture,” was also added to the “foreign agent” blacklist. The crackdown also manifested itself with respect to Russia’s rejection of #JeSuisCharlie protests, demonstrating solidarity with the victims of recent terrorist attacks. Post-Soviet Russia continues to operate in Chekist fashion, typical to the modus operandi of the gray apparatchik in charge. Politically correct messages designed for external dissemination are dramatically different from the real agenda, reserved for internal consumption. Orthodox demonstrators, who blamed the victims of Charlie Hebdo terrorist attacks for their own deaths, were neither arrested nor prosecuted. To the contrary, while sullen-faced Lavrov marched alongside world leaders in the Charlie Hebdo march, Russian police were arresting protesters for carrying signs that read “Je Suis Charlie.” One of these picketers, Mark Galperin, was sentenced to 38 days behind bars. 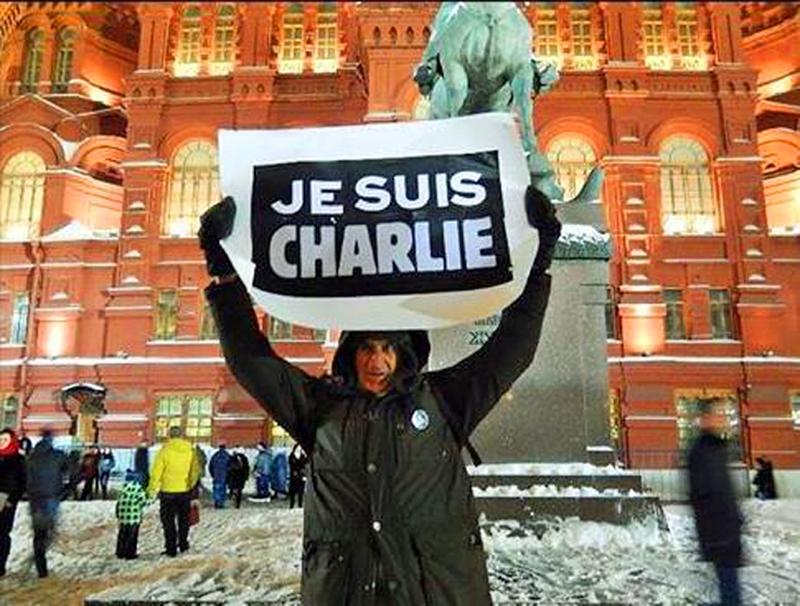 Another “Je Suis Charlie” protester, Vladimir Ionov, a retiree in his 70s, was ordered to pay heavy fines. He was also hit with additional criminal charges, is barred from leaving Russia and now faces up to 5 years behind bars. To investigate the alleged transgressions of the lone Charlie Hebdo picketer, Russian authorities created an investigative committee, ludicrously made up of 9 investigators. Ionov is the first Russian citizen to ever face charges under Russian criminal statute 212.1, which imposes heavy penalties for unsanctioned protests that take place on more than one occasion. [UPDATE] On Jan. 20, 2015, Russian authorities brought criminal charges under criminal statute 212.1 against Mark Galperin. In the meantime, Russians mock the popular hashtag #JeSuisCharlie by creating #JeSuisValera, designed to support Russian soldier Valera Permyakov. He admitted to brutally murdering six members of the Avetisyan family, including two small children, which led to mass protests in Gyumri, Armenia. Russia is refusing to hand over Private Permyakov for prosecution by the Armenian authorities, in direct contravention of the treaty between Russia and Armenia. The treaty provides that crimes committed by Russian military personnel in Armenia shall be investigated according to Armenian law, except in cases when a military crime is committed, or a law is broken directly on the base premises. Since Permyakov deserted the base with a weapon and slaughtered the family in their own home, the murder must be investigated and prosecuted by the Armenian side. Needless to say, Russian authorities are known to suffer from selective amnesia, obeying the laws only when it’s convenient for the powers-that-be. The contradictions are further illuminated by Russia’s kidnapping and continued unlawful detention of Ukrainian pilot, Nadiya Savchenko. Russia-watchers the world over experience the surreal sensation of peeking behind the looking glass, where clocks run backward to the Soviet times, black is white and wrong is right.